The Environmental Protection Agency (EPA) has just finalized its regulation requiring that new cars and light trucks (light vehicles) achieve average fuel efficiency of 54.5 miles per gallon (MPG) by 2025 (4.3 liters per 100 kilometers). 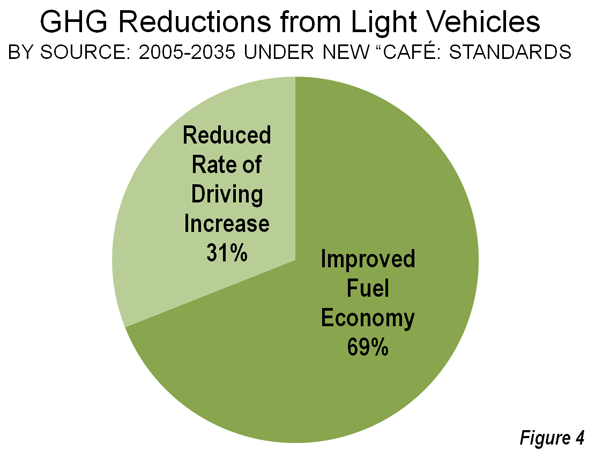 This increase in the "CAFE" standard (Corporate Average Fuel Efficiency) is the second major step in the Obama Administration's program to improve light vehicle fuel efficiency. In 2010, EPA adopted regulations requiring 35.5 MPG average by 2016 (6.6 liters per 100 kilometers). The EPA standard is based upon carbon dioxide (CO2) grams emitted per mile of light vehicle travel, with an average of 163 grams per mile (101 per kilometer) to be achieved in 2025. This is slightly above the 2020 European Union standard of 152 grams per mile (95 grams per kilometer). Of course, the regulations have both supporters and detractors, with the automobile manufacturers being among the supporters. Assuming the objectives are met, the reductions in CO2 emissions will dwarf the modest gains forecast from anti-suburban smart growth policies. For decades, this powerful movement has sought to limit or prohibit suburban expansion and even outlaw the detached housing that most people prefer. This includes railing against automobile use and seeking to coerce people out of their cars (as expressed by Secretary of Transportation Ray LaHood). The anti-suburban movement has many labels in addition to "smart growth," such as “densification policy," "compact cities," "growth management," "urban consolidation," etc. The origins can be traced back to just after World War II, with the enactment of the British Town and Country Planning Act. The policy origins of smart growth in the United States date from the 1960s (the state of Hawaii) and 1970s (the state of Oregon and California local jurisdictions). With concerns about greenhouse gas (GHG) emissions (principally carbon dioxide, or CO2), proponents saw the opportunity to force people back into the cities (from which most did not come) and turn smart growth into an imperative for "saving the planet." This is no exaggeration. As late as last month, this was claimed by fellow panelists at a Maryland Association of Counties conference. As is indicated below, the data shows no such association. Even forecasts by proponents fall short of demonstrating an apocalyptic necessity for smart growth. The Cambridge Systematics and Urban Land Institute Moving Cooler report attributed only modest reductions in CO2 emissions to smart growth's land use and mass transit policies (Moving Cooler was criticized on this site by Alan Pisarski. See ULI Moving Cooler Report: Greenhouse Gases, Exaggerations and Misdirections). The data in Moving Cooler suggests an approximately 50 million ton reduction in CO2 emissions from these smart growth strategies by 2035 (interpolating between 2030 and 2050 figures). The more balanced Transportation Research Board Driving and the Built Environment: The Effects of Compact Development on Motorized Travel, Energy Use, and CO2 Emissions produced similar figures, however it indicated skepticism about whether their higher range projections were "plausible." 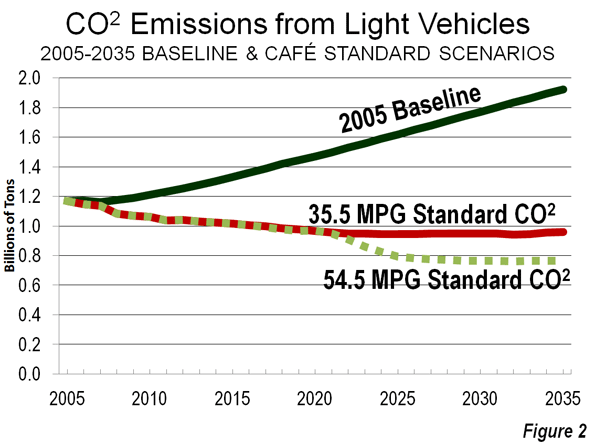 At the 2005 fuel economy rate and the projected driving increase rate in the US Department of Energy Annual Energy Outlook:2008 (AEO), CO2 emissions from light vehicles would have increased 64 percent from 2005 to 2035 (Note 1). This could be called the "baseline" case or the "business as usual" case. This would have resulted in a CO2 emissions increase from light vehicles of approximately 0.75 billion tons. 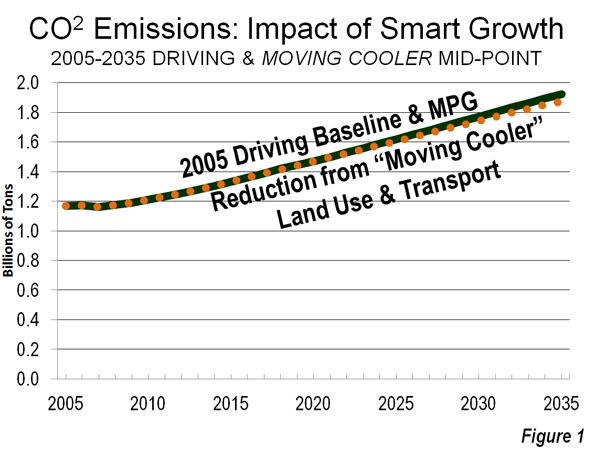 Using the more aggressive Moving Cooler forecast, the smart growth transport and land use strategies would only minimally reduce CO2 emissions from the baseline case (64 percent above 2005 levels) to 60 percent. This is "chicken feed" (Figure 1). Under the previous 35.5 MPG standard, AEO:2008 and AEO:2012, a 19 percent reduction in CO2 emissions from cars and light trucks would occur from 2005 to 2035. We modeled the new regulations based upon AEO:2012 forecasts for the earlier regulation. This yielded a 2035 CO2 emission reduction of 35 percent from 2005 (Figure 2), despite a healthy one-third increase in driving volumes over the period. The calculation also includes an upward adjustment for the rebound effect, as lower costs of driving encourage people to drive more, which EPA estimates at 10 percent ("induced traffic"), which is indicated in Figure 3. 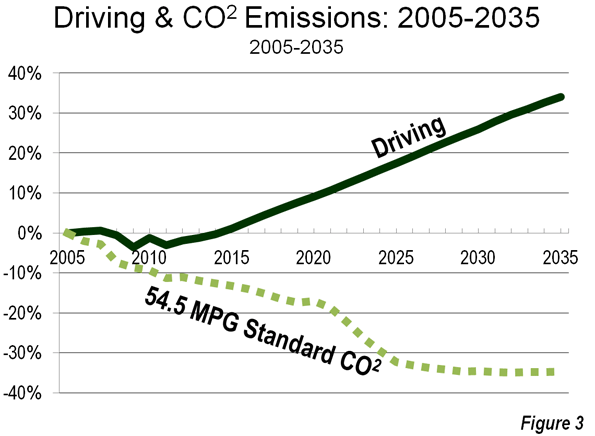 Achievement of the 54.5 MPG standard would reduce CO2 emissions from light vehicles from 1.9 billion annual tons in 2035 under the 2005 baseline to approximately 0.750 billion metric tons in 2035. Approximately 70 percent of the decline in CO2 emissions would be from improved fuel economy, while 30 percent would be from slower annual increase in vehicle travel that has been adopted in AEO:2012 (Figure 4). The increase in driving is now forecast at 33 percent from 2005. 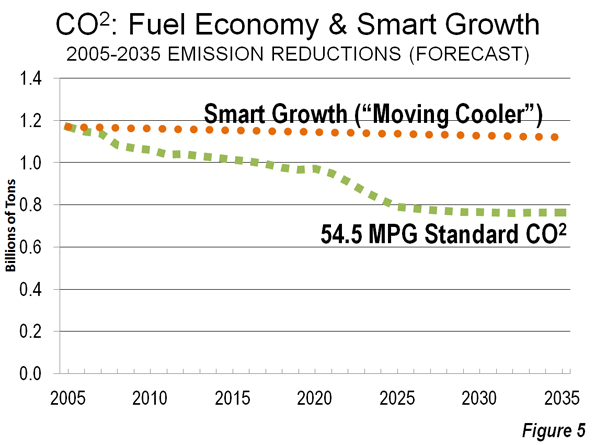 The contrast between the potential CO2 emissions from smart growth and fuel economy is stark. By comparison, the annual overall reduction in CO2 emissions (from the 2005 baseline) would be virtually equal to the 30 year impact of smart growth (Figure 5). The 35.5 MPG standard would make cars and light trucks less CO2 intensive than transit. At work trip vehicle occupancy rates, the average new light vehicle would emit less in CO2 per passenger mile in 2016 than transit in all but eight of the nation's 51 metropolitan areas over 1,000,000 population. The 2025 54.5 MPG standard would drop that number to two (Note 2). Even before these developments, there was only scant potential for replacing automobile use with transit (much less walking or cycling) because of its long travel times. According to data in a Brookings Institution report, less than 10 percent of jobs in the largest metropolitan areas can be reached by the average resident in 45 minutes on transit (Note 3). Smart Growth: Not Needed to "Save the Planet"
Smart growth is an exceedingly intrusive policy that would attempt to enforce personal behaviors, counter to people's preferences, by attempting to dictate where people live and how they travel. This is expensive as well as intrusive. It is also detrimental to the economy, which is already taking a toll in lower household discretionary income (especially from higher house prices) and stunted economic growth. A report by The McKinsey Corporation and The Conference Board indicated that sufficient CO2 emissions could be achieved with "…no downsizing of vehicles, home or commercial space and traveling the same mileage" and "…no shift to denser housing." Or, more directly, smart growth is unnecessary, in addition to producing little "gain" for the "pain." Note 1: The 2030 to 2035 driving volume is estimated using the annual percentage increase from 2025 to 2030 in AEO: 2008, which has data through 2030. Note 2: Calculated from 2010 National Transit Database summary by Randal O'Toole of the Cato Institute. These calculations assume the 250 gram per mile standard for new light vehicles in 2016 and the vehicle occupancy ratio of 1.13 for work trips from the 2009 National Household Travel Survey. Note 3: Limited transit access is not just an American problem. In Paris, with arguably the best transit system in the western world, the average resident of a suburban new town on the regional metro (RER) can reach twice as many jobs by car as by transit in an hour, according to Fouchier and Michelon. Submitted by Leah Willis on Fri, 09/05/2014 - 08:07. As we know we are getting closer for the destruction of earth day by day so we need to focus on how to get relieve from that in natural way, so we are taking new technologies for reducing that so as to introduced electrical vehicle in place. And for the better care we need a right servicing point where we will get the proper service and care for our car whether it is Mercedes BMW or Mini. Submitted by DrewBarrymore on Mon, 09/01/2014 - 08:13. Nice blog. There are various types of car which are fuel efficient. fuel efficient cars are also very much essential for the users as well as for the environment. environment getting very polluted by the use of these petrol cars so our automakers invented fuel proof cars like electric cars, hybrid cars and etc. Submitted by JimBackus on Tue, 08/05/2014 - 05:37. Informative article. Now fuel economy has became the major factor to be consider before buying a car. Everyone look for a good mileage vehicle along with high quality feature. From environment point of view cars must be fuel efficient and pollution free. By keeping this in view automakers developed the electric and hybrid cars. 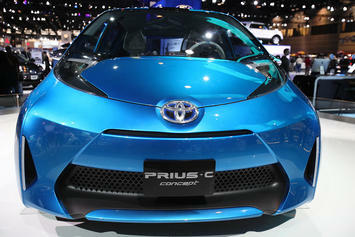 We can call these car as fuel economy cars which are Eco-friendly and giving excellent features. Submitted by Eric Clarke on Tue, 08/05/2014 - 02:04. As this post is a best relevant towards the development of country and the fuel economy stability,we need to know the loopholes where we can make some new theorem for that.But the rough use or any other reason is not that much causing this effect but the people like the owner of cars like BMW, Mini. Audi Porsche etc they are not concerned about it that affects the oil reduction naturally.So we should be careful and have the knowledge about our car and its servicing time, as well the best service point for it. Submitted by kiaracruz on Wed, 07/16/2014 - 02:59. Growth of the market proportionate to the invention of new technology that can increase the efficiency of fuel to enhance the fuel economy. Increase or decrease in fuel economy depends upon the use of automobile in market. More the number of vehicle use of fuel becomes more. But sometime it is found that if there would have some problem in the car parts then use of fuel increases that affects the vehicle as well as to the economic condition. In order to prevent from these situations better to take your vehicle to servicing center like Mercedes Repair Houston, TX and get your Mercedes well serviced. Submitted by rose on Thu, 06/26/2014 - 04:11.
thanks for showing us the real status of the fuel economy.. It could be helpful to us.. Submitted by shanebennett on Thu, 05/22/2014 - 04:18. The Environmental Protection Agency (EPA) takes several beneficial steps to protect America's environmental situations; therefore American President Obama takes different positive steps such as; fuel economy and many others. Under fuel economy we have found various types of strategies and process; that helps to reduce the cost of fuels as well as protect environmental system. Most probably electric and natural gas is the only solution to deal with environmental issues that occur through vehicles. Electric vehicles are producing less smoke and also it helps to save fuel; same case is applicable with natural gas also. Submitted by carltonryder on Mon, 03/31/2014 - 02:56. In the United States of America we have found different types of policy on automobile sector such as; fuel policy, hybrid car or electric car policy. Basically due to fuel price hike we have found different negative circumstances on automobile industries that directly affect the transportation system of the country. With the help of better fuel efficiency vehicles as well as best fuel economy planning and strategies; we are able to save the downfall of fuel vehicles. Otherwise in near future we all are switched towards the use of hybrid vehicles (electric vehicles). Submitted by nathansanders on Fri, 02/21/2014 - 02:18. Due to hike in fuel price at regular intervals we have found that; people were worried about their vehicle fuel efficiency system. And in most of the occasion fuel price simultaneously affect countries economic system. Therefore government authority take beneficial steps to deal with fuel prices by providing better options on fuel efficiency vehicles. Submitted by BraadHog on Thu, 09/12/2013 - 01:08. Pollution is getting worse day by day, it is only because of smoke of vehicles. It is a headache for all scientists. Environmental protection agency has taken a good attempt to integrate more zero-emission vehicles into the market. Really it is a great step towards reduction of pollution.